When Amazon launched in 1994, it faced an uphill battle. The online retailer was going up against established brick-and-mortar titans such as Borders and Barnes & Noble — both of which had vast networks of stores from coast to coast. This real estate advantage soon became a liability as e-commerce continued to evolve. Amazon was able to avoid many of the costly staffing, rental and utility expenses that brick-and-mortar stores have to pay. In fact, the new-e-commerce paradigm was so successful that many believed brick-and-mortar stores might soon become a thing of the past. Fast forward 25 years later, and a new paradigm is emerging as online retailers increasingly turn their attention back to the brick-and-mortar business model. Yet, why would any e-merchant embrace physical store locations in today’s digital, online world? Maintaining and operating physical store locations introduces a host of logistical headaches. When done correctly, though, this approach can also open a lot of exciting opportunities. Amazon, for example, has begun using brick-and-mortar retail to help fill some of the gaps in its highly successful online business model. With its new Amazon Go grocery stores, the company hopes to provide customers with fresh, same-day produce — instead of forcing users to wait for delivery. Home furnishings retailer Wayfair has begun launching physical locations to offer its users a genuine in-store experience. The company hopes to compete with IKEA’s iconic walk-through display rooms. Online mattress retailer Casper and fashion boutique Rent the Runway are both exploring brick-and-mortar stores to provide their user bases with a “try before you buy” experience. Shopify is an online logistics management firm that caters to retailers around the globe. It recently “got physical” in Los Angeles so it could offer workshops for many of its B2B clients. The company hopes these in-person demonstrations will help it sell big-ticket items to corporate decision-makers. Harry’s is an online firm that sells grooming and personal care products for men. The company now believes it has the name recognition to compete for shelf space — along with more established brands. There are even brick-and-mortar chains that are expanding their physical presence to help boost awareness. Nordstrom, for example, recently introduced new store locations that don’t even carry inventory. They only provide styling tips and makeovers. 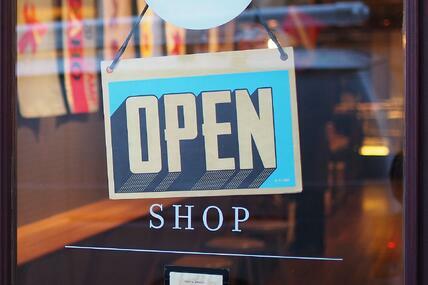 As an E-Commerce Merchant, Should You Go the Brick-and-Mortar Route? You should only launch a physical store if you have a compelling reason to do so. After all, you’ll be taking on extra expenses and headaches with each new location. The benefits have to outweigh those costs. The retailers mentioned above all had specific goals they wanted to achieve. Going the brick-and-mortar retail route made sense for them. Whether it also makes sense for you depends on your goals. Still, it’s possible to “test” the waters while keeping your investment and exposure to a minimum. For example, pop-up shops are a relatively new retail fad in which brands open temporary locations to host parties, launch products and generate buzz. Want to learn more about this growing brick-and-mortar trend?